PLEASE NOTE THAT THIS CRUISE IS ABOARD OUR NEW VESSEL THE M/V CELIA THAXTER WHICH IS THE VESSEL PICTURED. 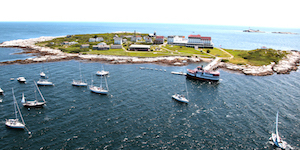 Cruise through Portsmouth Harbor and listen to the history and lore of one of New England's very oldest ports including the stories of Paul Revere's ride to Portsmouth that helped ignite the American Revolution, the daring espionage of a young German U-boat commander during WWII, and the eerie history of the castle like "Alcatraz of the East" to name just a few. You'll also see present day port operations first hand including a modern Coast Guard rescue station, lighthouses, several historic forts, a naval shipyard and possibly a fast attack nuclear submarine, colonial architecture, wildlife and much more. Exceptional photo opportunities abound on this cruise as we get quite close to many of the points of interest noted above. Welcome Aboard our new vessel the M/V Celia Thaxter!